The carnival in Venice is the most famous carnival in Italy with its colorful masks, parades of gondola and fireworks; and it is one of the oldest worldwide. 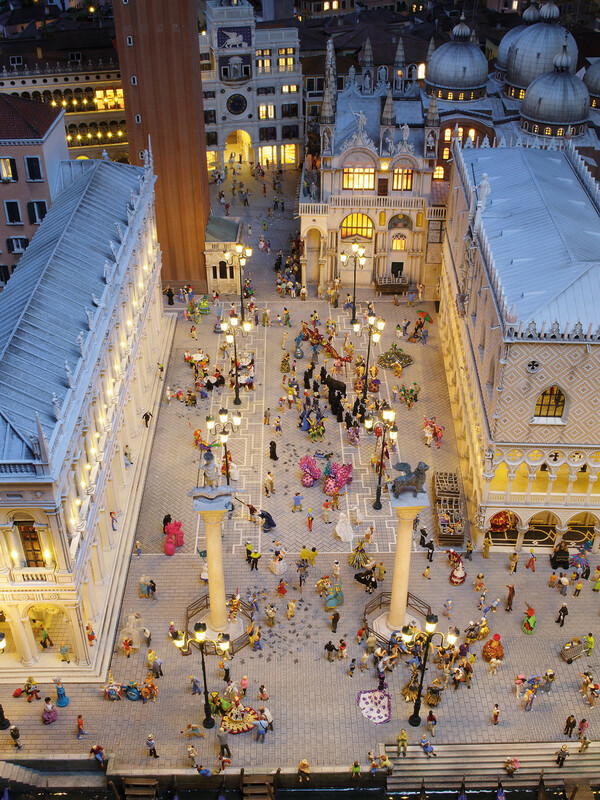 In Wunderland however, we have carnival in St. Mark’s square all year round. The Wunderlandians celebrate the beginning of fifth season in colorful costumes. Of course, the costumes have all been elaborately hand tailored by the model building fashionistas. Our very own fashion designer Bobby was so thorough; he could only dress two people per day. However, his effort paid off because more than 150 splendidly dressed Venetians celebrate in the streets of the city. As if this beautiful carnival weren’t enough: At the push of a button an angel floats graciously from the tower, lands on a stage in the midst of the crowd and opens the celebration. This tradition transforms the historic city into a colorful ballroom and to the Italians it is known as "Volo dell 'Angelo" - the angel’s flight.